The government of India has taken a decision to withdraw ’25 paisa’ coin from circulation from June 30 2011. 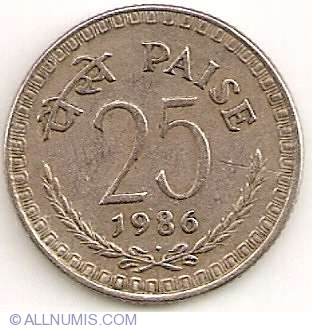 From this day the 25 paisa coins will cease to be legal tender in the country. The days of ‘chavanni’, ‘chhar aanaa’, ‘paavli’ will be over. ‘The minimum denomination coin acceptable for transaction will be 50 paise from that date,’ the Finance Ministry said in a statement Thursday. From June 30, 2011, together with 25 paise coins, all other coins of lesser denomination – one paisa, two paise, three paise, five paise, ten paise and 20 paise — also ‘will not be accepted in transactions’, it said. Most of these coins vanished a long while ago as the government found the cost of minting them many times more than their face value. From June 30, 2011, these coins will cease to be legal tender for payment as well as on account. The procedure for call-in will be notified separately by the Reserve Bank of India (RBI), the ministry said. This is because of very high inflation. High Inflation is caused because Indian Rupee is a fiat currency that is being printed in very large quantity by Congress Government to fund defunct schemes like NREGA.